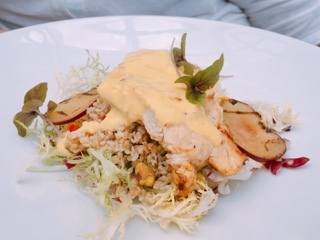 For a really good deal during Summerlicious, visit a restaurant for lunch. Most establishments offer similar options between lunch and dinner and there’s a $20 difference to merely eat at a different time. Of course, it’s not always feasible to indulge in a 3-course menu on weekdays and some places, if they offer a brunch menu, won’t honour Summerlicious on weekends. Hence, finding a weekend lunch spot can be difficult. 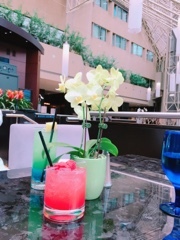 Azure, situated in the Intercontinental Hotel downtown, is one option; their central location makes it ideal for visiting before a matinee or an afternoon Blue Jays game. 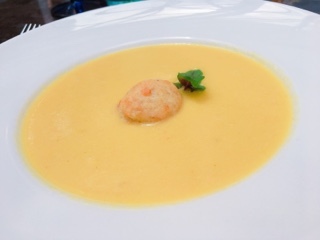 Their corn soup arrives looking like the typical smooth puréed broth. Then you have a taste and the hit of chili lime mixed with the sweet vegetable creates an interesting summery starter. In the centre, the smoked cheddar biscuit adds a soft doughy chewiness; it’s good, but something crispy or a dollop of corn, onion, and black bean salsa would be even better. 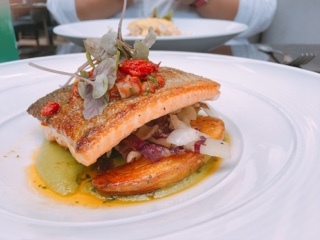 As the pan roasted rainbow trout was presented, I couldn’t take my eyes off the beautiful glistening skin; this is going to be a good piece of fish! I wasn’t disappointed, the skin was impeccably crispy and the meat flaky and moist. With a smear of the refreshing lemon basil pea purée or slightly spicy sundried tomato relish, the main was flavourful and delicious. Even the accompanying well-seared fingerling potatoes, lightly pickled radicchio, and crispy shaved fennel were spot on. Although the grilled chicken didn’t look impressive, it’s still tender and tasty thanks to the creamy citrusy butter sauce on top. Despite the menu describing the dish as grilled, the chicken seemed poached, it's really juicy and tender. When mixed with the sauce, the bulgur salad is quite delicious, but on its own a tad bland. Truthfully, I wasn’t a fan of the strawberry tart. 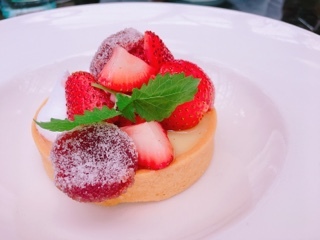 For a dessert that sounds light and summery, the strawberry jam gummies and crunchy rosewater candy pieces in the centre were too fussy and sugary. Meanwhile, the lime basil curd filled shortbread tart was nice. If it were simply topped with strawberries and chantilly cream, it’d be more than enough. 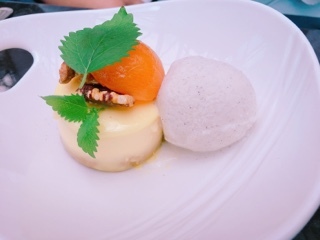 My friend's white chocolate cheesecake was a better choice; the rich luscious cake paired with rose wine poached apricots and toasted walnuts. Yet, it’s the cardamom gelato that’s the most surprising, looking like vanilla bean, but adding such a lovely earthy essence against the fruit and cake. While saving money on the meal, you can splurge on one of Azure’s hand-crafted cocktails. 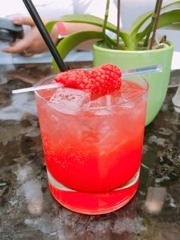 The raspberry cooler ($16), combining raspberry vodka, lemon juice, simple syrup, and muddled fresh raspberries, created a drink that tastes exactly like a raspberry Freezie, complete with the tangy fizz that tickles the back of your throat. Having visited Azure previously for dinner, it felt like a completely different restaurant during the afternoon. With the dining room’s wall and ceiling glass panels, the sun shone through brightly; it was like sitting outside without the pesky bugs and traffic noise. Then, after a satisfying lunch, Toronto’s downtown attractions is but steps away, perfect for walking off those extra Summerlicious calories.